A shredable toy with lots of movement! The top is a braided sisal, then several layers of colorful wooden pieces. The woven globe has wooden parts and stuff with more shredable goodies and there are several legs of woven rings hanging from the globe. 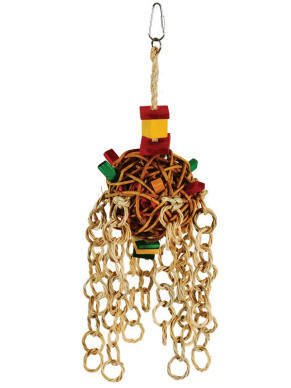 This fun toy is topped with a nickel plated pear shaped quick link for easy hanging. Good toy for a variety of parrots, smaller to mid-large sized beaks! Be sure to use the woven globe area to stuff with some of your parrots favorites like a couple of almonds in the shell! Great way to encourage natural foraging behaviors.